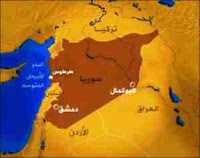 Washington [desolated]: Syria is gliding into a hell. Obama gives Assad green light for using all arms with the exception of chemical [weapons] in [slaughtering] his [own] people. The above evaluation of the Obama administration, helplessly watching Syria to glide into disaster, seems to enrage many Syrians. However, any military intervention would be almost impossible in the frame of a global and regional constellation that is generally opposing such intervention even though for different reasons of the sides involved. President Assad: Syrian media have the possibility to beat the "empires of information" that are [really] having behind them not only "the money" but as well the political intention [prevailing] in major capitals of the world. 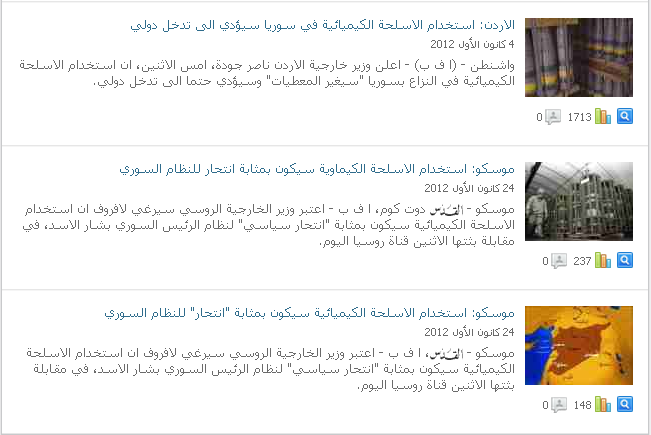 And that is a [proof] of success of the Syrian media. As to Bashir al-Assad, his attitude can only be understood as some kind of "loss of reality" thinking, not rarely to be found in the final stage of a dictator's career. However, there is some truth in his words when he argues that "empires of information" are not really independent. Sure, he is speaking of CNN and Al-Jazeera, both media organizations enjoying vast international acceptance and influence. Considering some information treatment by CNN, I feel uneasy with the fact that news of high importance are handled in a rather superficial way as time on air is granted only on the basis of how to feed an auditorium that, long ago, turned into a sensation-seeking herd feeding on the special kick of, especially, bad news. The obvious goal of news shows like "Situation Room with Wolf Blitzer" or any "Developing Story" in the daily news is to keep visitors watching at almost any price which can be regarded as a circumstance rather hampering any adequate reporting of news events. In comparison with CNN, Al-Jazeera seems to follow a rather moderate way of combining breaking news with their related background stories, yet, both media giants are under a similar and increasing economic pressure which makes it difficult for them to follow a neutral strategy. When it comes to political influence, I sometimes observed some tendency of thinking on, both, CNN and Al-Jazeera which might be due to a personal inclination or, rather, the slight difference between personnel coming from different ethnic and social communities which is nothing to worry about. Syria - Chemical Weapons Out Of Control ? Arabic background information further down ! Last Update: December 29, 2012. Israeli Prime Minister Benjamin Netanyahu held talks with Jordan's King Abdullah II in Amman recently to discuss violence in Syria and the country's chemical weapons stock, Israeli media said Thursday [i.e. Dec 27]. Public radio, as well as several local newspapers, said Israeli and Jordanian officials had confirmed the meeting, which was first reported in the Al-Quds al-Arabi daily on Wednesday. A spokesman for Netanyahu declined to comment on the reports. The date of the meeting has not been reported, but Israeli media said the meeting focused on the regional threat posed by Syria's chemical weapons stocks. "Both sides arrived at the meeting with maps in hand," the Yediot Aharonot daily said. 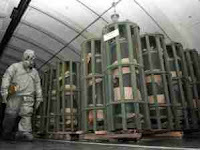 "Their maps marked the various sites across Syria where the forbidden weapons are being stored." The newspaper cited Jordanian officials as saying the king and Netanyahu "raised situation assessments about the 'day after Assad,' and examined the danger posed by the chemical weapons in Syria to the neighbouring countries, first and foremost Jordan and Israel." Israeli and Jordanian leaders held secret talks on the situation in Syria. The first article, dating back to December 4, is quoting the Jordanian foreign minister Nasser Judeh saying the use of chemical weapons in Syria would necessarily lead to an international intervention. The second article, dating back to December 24, is citing Russia's foreign minister Sergej Lavrov saying the use of chemical weapons in Syria would be kind of "political suicide" for the Syrian regime of Bashir al-Assad. The third article that is showing a map of Syria seems to be a mere update of the above article from December 24 quoting Russia's foreign minister. Furthermore, that article is citing a related AFP report. Morsy: Security of the Gulf region is [a matter of] national responsibility and will [smash] any armed intervention in Syria whatsoever. Official Results from December 25 further down ! Above: Predicted overall result for the second stage of voting. After the counting of more than 63% of votes following yesterday's second round of voting, it becomes clear that president Morsy's constitutional draft has been accepted by an overwhelming majority of 70.9%, result published at 10:00 GMT this morning by the Arabic channel of Al-Jazeera. Rural areas are approving the new constitution by even more than 80%. Only the Red Sea tourism resorts bring about some 60% of votes in support. Even though urban areas present lower support than rural areas [i.e. Kairo / al-Jiza 66.3%, Alexandria 55%, Suez 70.4% and Port Said 51.1% votes in favor of the constitution], these first results are already proving widespread agreement to the president's constitutional draft which is considered to promote a democratic state based on Islamic values. According to different European media (German TV / ARD, France 24), last voting results in the Egyptian referendum are showing a 64% majority of all votes in favor of president Morsy's constitutional draft. Voting participation should have been rather low at 32%. A member of the electoral commission said that any voting results are to be considered as inofficial up to now. As expected, the opposition has already voiced accusations of fraud during the referendum. Above: Latest election results predicted by Al-Jazeera on December 23/24 and worked up by Ulysses. Nearly two-thirds of voters in the Egyptian referendum have supported a proposed new constitution, the electoral commission has announced. In all, 63.8% of voters cast Yes ballots in two stages, on December 15 and 22. The commission announced the result live on state-run Nile News TV. Parliamentary elections must now take place within two months. 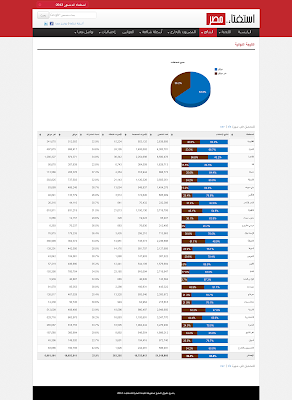 Above: Official Results published by Egypt's Electoral Commission. The overall result of both rounds of voting is presenting some 63,8% of votes in favor of the new constitution according to the electoral commission and different international media. Unfortunately, the outcome of the second round of voting has not been mentioned. However it can be counted by using the outcome of the first round of voting from December 15 which was 56.6% according to CNN [news service on December 27]. The counted outcome of the second round of voting should therefore be 71%. The result fits perfectly with the predicted 70.9% published by Al-Jazeera on December 23 (diagram on top of this blogspot). This implies an increase of Yes-votes for the constitution in the second round of voting ! 25 Million Egyptian voters in 17 districts are [presenting] their vote in the second and last round of the referendum for the new constitution. During the second round of voting for the constitutional draft in Egypt, vice-president Mahmoud Mekki (above picture left) declares his resignation from office. Mahmoud Mekki says he resigns because the political work doesn't [offer] a quality in its structure [suitable for] a judge. The legal [settings] of Egypt's new constitution don't fix the existence of a vice-president to the republic. Mekki says he [made up his mind] to resign [as early as] November 7, however postponed the announcement [because of] certain preparations. Above: Visitor access points from the region to "blueprint news", including some most probable positions of German Patriot missiles, as published two days before in my blogspot Syria at the Mercy of Opposing Powers. Only some days ago, German media were still wondering about the urgent installation of two German Patriot units in Eastern Turkey and the related deployment of up to 400 German troops. Knowing that artillery rockets or rocket propelled grenades (RPG) which recently hit Turkish border settlements were just too tiny targets for the Patriot missile defence system, one might come to think that any official explanation given was only to hide the probability of Iranian medium-range missiles hitting our NATO ally Turkey whenever it came to an armed conflict already looming between the U.S. driven by Israel and the Islamic Republic. Above: Range of Syrian Scud-D missiles. From that point of view, yesterday's news coming from CNN had something "soothing" in it. They told us that Syrian government troops had already applied some four Scud-D rockets in their fight against the own people. Such missiles developed in North Korea on the basis of a Soviet designed model could be fitted with chemical weapons. Their range of 700-800 km would make it possible to reach Israel as well as Ankara, the capital of Turkey. According to CNN, the Assad regime should have 700 of such Scud-D rockets in stock. This evening, CNN talk master Christiane Amanpour dealt with growing demands of restricting the possession of private weapons after the December 14 massacre at Sandy Hook elementary school in Newton / Connecticut where a mentally disturbed youth took 26 lives, including 20 children, in a shooting spree before killing himself. Debra Maggart, former Republican Tennessee legislator with a general pro-gun attitude, reported on how National Rifle Association NRA had been turning against her during her election campaign when she decided not to support an NRA promoted bill Maggart considered to be unnecessary. NRA's official comment after the Sandy Hook massacre was: "The only thing that stops a bad guy with a gun is a good guy with a gun." This is what Wayne Lapierre, executive vice-president of the NRA, said today, his speech being disrupted by protesters. Instead he argued, special school guards should be armed in order to increase security for kids. Andrew Goddard, president of the Virginia Center for Public Safety, referred to this when he said the head of the NRA is not necessarily representing the NRA's four million members but rather obliged to promote the selling of more guns on behalf of the gun making industry. It's a well-known problem in the U.S.A. that widespread and sometimes militant lobbyism of the gun maker's industry has blocked any tightening of laws that are, up to now, allowing almost unrestricted private possession of weapons in some states. Yet, there is an interesting aspect that might change this situation on a long term. As pension funds are partly based on shares of the gun maker's industry, economic pressure might be possible to change the industry's behaviour. Additional material on the phenomenon of school shooting and on school shootings in the U.S.A. is easily available on the web. - Personnel of the Sandy Hook fire brigade in grief after the massacre. - First Lady Michelle Obama addressing the victimized families. The Syrian center for information: The Free Army is blocking the supply route running between al-Rastan and Hama. Iran's ministry of foreign affairs: A solution to the Syrian crisis [should be] possible by way of an intermediary phase that is permitting the [national] assembly to prepare [general] elections and a new constitution. Iran's ministry of foreign affairs: An immediate downfall of the Syrian regime is unlikely and, both, Syrian [government] troops and the apparatus of state are easily acting [i.e. fully functioning]. A member of the National Coalition of Syria: Russians and Iranians in Syria are legal targets for the revolution because of their government's position hostile to the revolution. the Referendum on a Constitution. Yesterday, December 8, 2012, the English channel of Al-Jazeera came with news of Egypt's president Morsy withdrawing his decrees that should have given him additional powers and the decision to put his own constitutional draft to public vote. Oppositional groups are refusing their support of what can be seen as a referendum on the disputed constitutional decrees. Today, December 9, that information was confirmed by a report from the Arabic service of BBC, London (above screenshot from their website). Today, the oppositional Front for National Salvation [is complicating] the [national] assembly's announcement of their position in the proclamation [of a constitution]. The president of the Al-Wasat party says the new proclamation assures [its] occurrence in all difficulties that are [spreading] dispute with their insulting [character]. Headline: Calls for a repetition [i.e. of voting] after predominance of "yes" [votes] in the Egyptian referendum. Basic results from the first round of the referendum on Egypt's constitution are showing a 57% support [i.e. for president Morsy's constitutional draft] and a 43% opposition [dividing] supporters and opposers while juridical organizations are calling for a repetition of that first round and are denouncing "ruptures" that are corrupting the process. 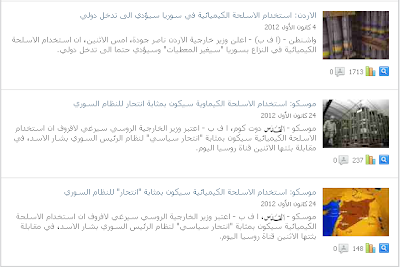 Headline: Egypt's opposition is calling for a repetition of polling in the referendum. The above photo is showing the decisive figures of Egypt's opposition: Amr Moussa, Mohammad Al-Baradei and Hamdin Sabahi (right to left). On Sunday evening [i.e. December 16] the journalist Mona al-Shazly told on [TV] channel MBC Egypt being decided to seize as the "bodyguard for the benefits of sharing" a vice-councillor to the community of the Muslim Brotherhood. The constitutional assembly, assigned to bring about the [new] constitution of Egypt, invited [Mohammad] al-Baradei, [Amr] Moussa and [Hamdin] Sabahi [to participate] in a dialogue to be held next Friday. The Egyptian vice-minister of justice refuses to supervise [anybody] not belonging to the jurisdiction during the first round of the referendum. Egyptian [citizens] abroad registered for polling are showing a 69% support for the constitution in 30 countries, especially in the Gulf states. 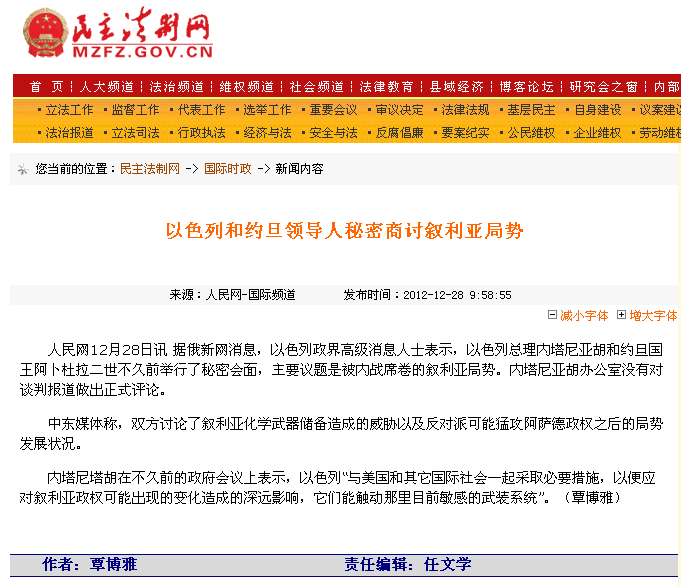 News UPDATE for December 6 included. Editor's POSTSCRIPT has been added on December 15 ! Yesterday, November 3, 2012, Al-Jazeera and other international media reported that Britain, France and Sweden have summoned Israel's ambassadors in order to voice their concerns over Israeli settlement plans. The United Kingdom announced that acual settlement plans would cast doubt over Israel's commitment to the peace process. Russia and Germany have also expressed their opposition to Israel's plans. This comes shortly after the United Nations General Assembly passed a pro-Palestinian draft resolution with an overwhelming majority. Israel immediately announced the building of more settlements after UN voted on Palestine's new "state observer status", Israel's government saying it would carry on building in places of strategic interest. Plans to build on the area are known as "E1" and would divide the Westbank in two. Furthermore, Israel is withholding tax revenue that should go to the Palestinian authority. In an interview with Al-Jazeera, Raanan Gissin (above), former senior advisor to Ariel Sharon, downplayed those Western statements as some kind of "constructive criticism from friends" rather than a slap into the face of Israel. Nevertheless the current proceedings are obviously expressing harsh criticism from an annoyed community of states that are fed up with turning a blind eye on Israeli policy towards their Semitic brethren in Ghaza and the Westbank. A Jewish merchant is offering a miracle drug intended to improve brain functions. One customer is eager to buy it and test it on the spot. After some time he begins to argue: "100 € such tiny bottle, isn't that much too expensive ?". The Jew appeases his anger: "You see, it's already working !" As to criticism from Germany there is something remarkable about it. Since 1949 when the German Federal Republic came into being, official politics of the GFR always acknowledged German responsibility when it came to the recompensation of Jews that had suffered from atrocities during the rule of the 3rd Reich. This included material and ideological support for Jews and for the state of Israel as well as a sincere treatment of related historic subjects in the education of Germany's youth (i.e. in schoolbooks and documentations). For the latter item I could serve as a witness. Even more, such politics was compatible with Germany's integration into a U.S. dominated Western alliance. However, as years and decades went by, it became clear to many Germans of the following post-war generations that such "eternal friendship" with Israel had turned into a ceremonial support of each and every demand and claim from Israel. Yet an increasing number of new voices made themselves heard, telling us that Israel's founders had learnt much from our disreputable ancestors when they decided to erect their new dwellings on the ruins of those belonging to the original inhabitants of Palestine. And I learnt that even some prominent German Jews (namely Hannah Arendt) opposed the way Israel was to be established. Theodor Herzl and the co-founders of Zionism might have imagined the Holy Land to become a homeland for the Jewish nation. But for the more realistic Zionists it could have been a decent corner in South America as well. Now, after so many decades of fighting between Israel's army and furious Palestinians, even Germany is getting annoyed of Israel endangering the fragile status quo of its region which is even better than a devastating war. First time that ordinary people in Germany noticed there was something wrong with German-Israeli relations was when German author Günther Grass, a laureate of the Nobel Prize for Literature, wrote his poem What Needs to be Said in which he referred to the delivery of German submarines to Israel. Now, considering the special commitment of German chancellor Angela Merkel with regard to Israel's security, it needs to be said that she came from a totally different environment having been raised by a practising Christian family in the German Democratic Republic, that second German state which perished in 1989. In her life she must have seen one or another of those GDR produced films celebrating German Communist resistance during the 3rd Reich. From there it seemed that all of those concentration camps or ghettos had been filled with honest citizens opposing the Nazi regime, some of them bearing Jewish names but which might have been a mere coincidence. Only to remember the awarded DEFA production "Jakob the Liar". Any responsibility for the mass annihilation of Jews had been categorically rejected by GDR authorities who claimed to represent the "antifascist part of Germany". Maybe, Frau Merkel later felt obliged to correct that picture presented by the land of her origin and promptly fell into an Israeli trap when she declared "German resposibility for the existence of Israel" in her speech before the Knesseth. I doubt that any other high-ranking German politician would dare to make such kind of statement once again, at least not less than a year before Germany's general elections. The great antitotalitarian thinker was no friend to the Jewish state. "... Arendt predicted that even if the Jews won the war, they would degenerate into one of those small warrior tribes about whose possibilities and importance history has amply informed us since the days of Sparta. Their relations with world Jewry would become problematical, since their defense interests might clash at any moment with those of other countries where large numbers of Jews lived. Palestine Jewry would eventually separate itself from the larger body of world Jewry and in its isolation develop into an entirely new people. Thus it becomes plain that at this moment and under present circumstances a Jewish state can only be erected at the price of the Jewish homeland. Arendt ended the piece by urging that it was “still not too late” to head off the partition of Palestine into Jewish and Arab sections and to prevent the declaration of a Jewish state. " Leseempfehlung für deutsche Leser: Die jüdische Aktivistin Hannah Arendt in Stellungnahmen zu Palästina und Israel. On December 11, 2012, the English service of Al-Jazeera reported that Israeli soldiers raided offices of 3 Palestinian civil society organizations in Ramallah, site of the Palestinian administration for the partly occupied Westbank, confiscating and damaging equipment. Entering before dawn, troops broke into the offices of the Women's Union, the Palestinian NGO Network and Addameer, an advocate for Palestinians in Israeli jails. This came shortly after the United Nations' decision to grant a state observer status to Palestine which might enable Palestinian authorities to directly appeal to the international crime court while referring to alleged Israeli war crimes. As to the "war of shadows" Israel is waging against its many enemies, a comprehensive documentation has been broadcast by German TV channel ZDF on December 14, 2012. That same documentation had already been broadcast before by another German channel (Phoenix) on September 19, 2012. From there, a broader German public could get an idea how Israeli security and the politicians behind them are dealing with anybody opposing their policies. ZDF also showed a report on what we know about Israel's nuclear arsenal and German arms export that needed German politicians to turn a blind eye on Israel's strategic goals. 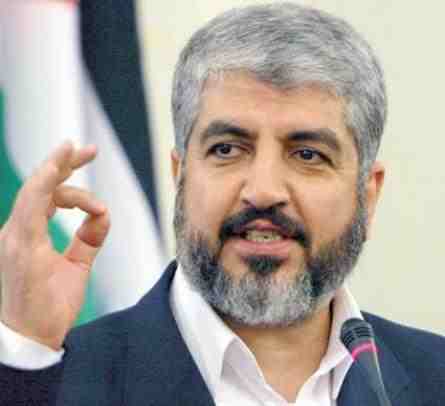 Khaled Meshaal, up to now chief of Hamas organization that is now trying to govern the Gaza strip once fell victim to an assassination attempt. On his way from a parking lot to his office in Jordan's capital Amman he was attacked by two Mossad agents using some kind of poison. While Meshaal was near to death, the would-be assassins could be arrested. On hearing about the incident, King Hussein of Jordan made clear that both Mossad agents would be publicly hung if Meshaal died. It then took only hours that former Mossad chief, Danny Yatom, appeared in Amman to deliver the antidote. Meshaal fully recovered. Only some days ago, he arrived in the Gaza strip, for the first time in years, to celebrate the United Nations' decision of December 2012. It's not my intention to take sides in that dirty war. However, there are aspects in it that need to be named. Many years ago, I became witness to an Intifada bombing when I spent some days in the town of Netanya. On my very first morning in Israel two heavy explosions rocked the town and devastated parts of the local market area. Later, lots of Israelis silently assembled around the bombing site and watched the police doing their work. I then noticed a small and rather shabby shop apparently selling photographic articles at the entrance of the market. It's tiny shop window was entirely filled with the animated dummy of a camera which attracted people to directly look into the fake camera lens that was focusssing the old market's center. If it was what I presumed, it didn't work to prevent the bombing. Even nowadays, when sophisticated electronic device can be used to survey each and every corner of a densely populated area, any warning will usually come to late. And it must be added that there is no technique the enemy cannot apply as well. Only recently, the overall observation of a Dubai hotel and highly developed means of investigation applied by Dubai police finally convicted Mossad agents who had assassinated one of their targets in his hotel room. An incident that led to just another international scandal raising the question about practical or political benefit of such killing operations. Even though some experts might consider the assassination of nuclear scientists in Iran as a decisive matter, wars cannot be won by killing some learned "pawns". On Thursday, December 6, the German government decided to provide two military units operating the "Patriot" missile defense system for Turkey after a request from Ankara and NATO headquarters. Both systems are intended to secure the Turkish-Syrian border after impacts of Syrian artillery rockets on Turkish territory. Their installation will be accompanied by a deployment of up to 400 German troops. The Patriot subject has been discussed since November 2012 (screenshot below quoting the November 17 news). 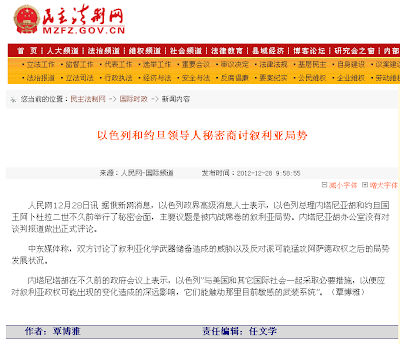 Excerpt from a comprehensive Chinese news article reporting on Germany's December 6 decision at the same time as German News TV launches their short statement. Guess who's searching for "implanted colonies"!